Animated physics offers an alternative to the understanding of conventional modern quantum physics. Here we use a fixed grid and fixed time steps, similar to frames in a movie, to model the particles and forces of matter and energy. You must run the animation for a period of time find out where a particle is at that time. You are not allowed to change the time frame or grid spacing while an animation is running. The world of animated physics is not deterministic. There is always a time and grid spacing smaller then the one you choose that could contain additional hidden variables. The photon is a harmonic oscillator with a restoring potential known as the Planck constant (h). 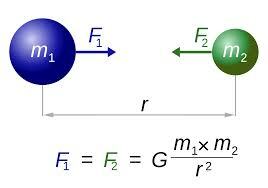 Planck’s constant, relates the amount of energy stored in a photon to its wavelength, E = h / λ. Put another way, Planck’s constant tells you the amount of time it takes the photon to undergo one cycle of whatever its doing given that the photon has a specific amount of energy. 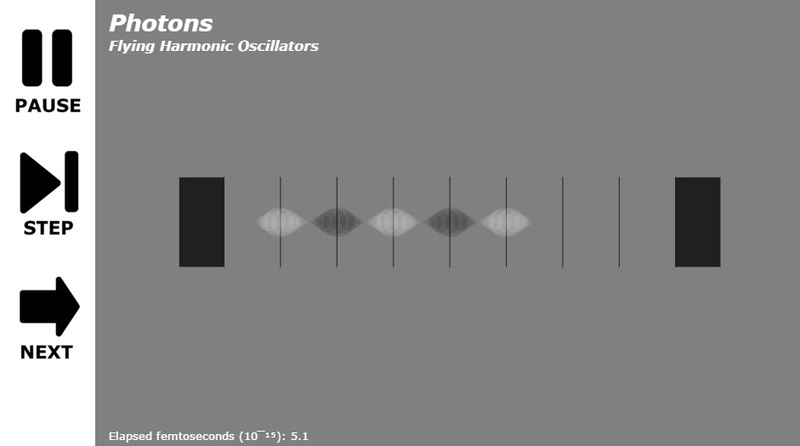 Viewing the photon as a moving harmonic oscillator allows each oscillator to store a specific amount of energy. If you split the oscillator, you end up with two oscillators (photons), each of which has 1/2 the energy of the original oscillator (photon). The next step is to put these photons in motion and watch them interact with each other in a small cavity over a period of time. Oscillating photons of one energy level are generated at random locations throughout a resonating cavity. A partially reflective mirror lets some photons 'leak' out one side. 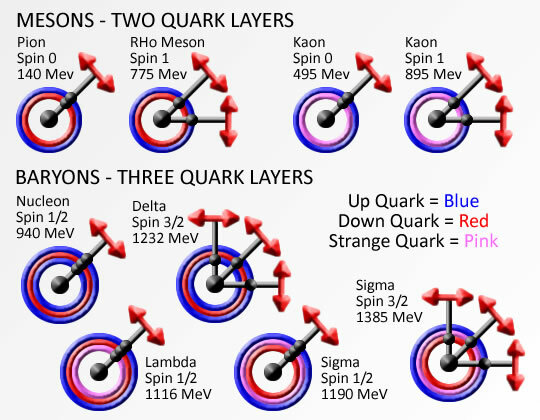 Photons only 'leak' past the mirror if their electrical phase is at a minimum and is growing. 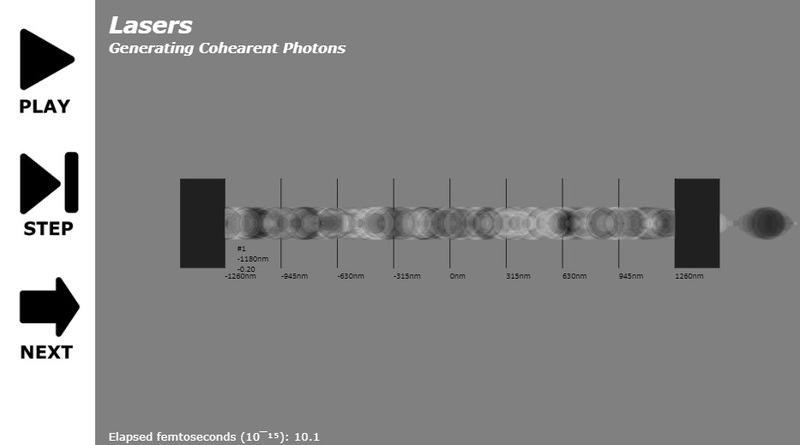 All photons emitted from the laser have a common starting point and phase, producing a cohearent laser beam. 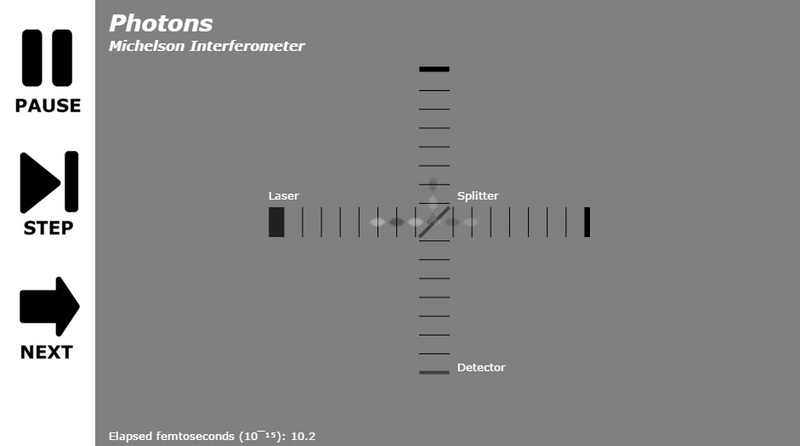 The Michelson interferometer is used to measure tiny differences in length along two different light paths. A laser light source is split into two arms with a beamsplitter. Each arm is reflected back toward the beamsplitter which then combines their amplitudes. The resulting interference pattern will record a fringe pattern. 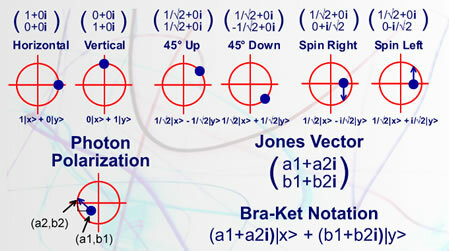 Between each frame, the force on each object from other objects is calculated using Newtons gravity law, the force is added to the velocity of the object and the velocity is added to the current location of the object. Animated Physics can find the length of time for an orbit as well as the highest (apogee) and lowest (perigee) points of the orbit. The orbit of Icarus around the sun takes almost two years to complete and ranges from 28 million miles to almost 300 million miles. 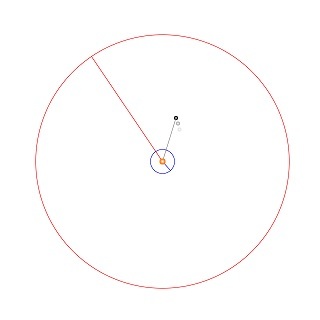 Tracking precession of the orbit (movement of the highest point of the orbit) over time requires new calculations. 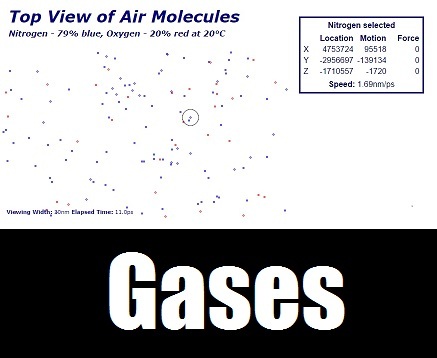 Newtons laws always produce an elipse with no precession. 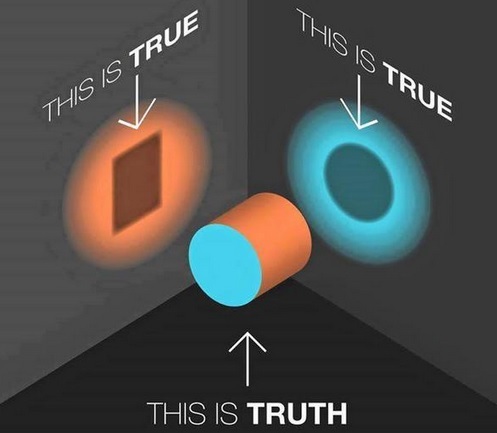 Einstein's relativity is required to introduce precession, singularities and black holes. Boyle's law from 1662, states that at constant temperature for a fixed mass, the absolute pressure and the volume of a gas are inversely proportional. This animation illustrates the normal air we breath at 20°C. 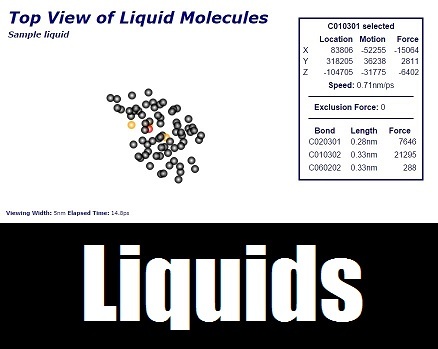 Free flowing molecules are travelling an average 2.1 nanometers per picosecond, trapped in a 3D box, 30 x 10 x 7.5 nanometers in size. 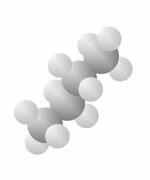 In 1873, Johannes van der Waals, derived the Van der Waals equation where repulsion between molecules has the effect of excluding neighbors from a certain amount of space around each molecule. 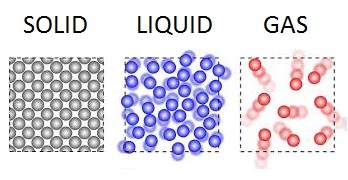 This principle together with the bonding between molecules is illustrated with liquid water molecules bonded together, trapped in a 3D box, 5 x 3 x 2 nanometers in size. 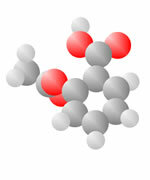 Explore the top of a block of potassium chloride, i.e. common table salt. 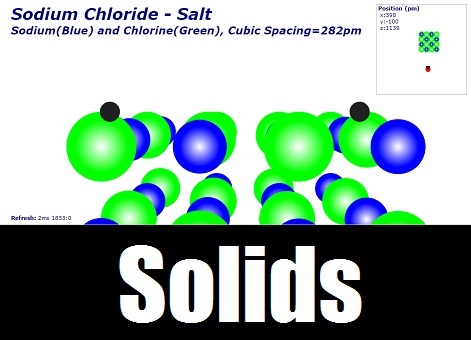 Common table salt has a face centered cubic (fcc) structure or lattice. Enter a 3D perspective view from just above the surface of the solid. 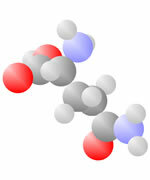 Drag a mouse across the screen to move forward, back or turn. You can see an overhead or topdown view of yourself in the top right-hand window. Energy is a state of matter defined by photons. Photons speed through space at the speed of light. They come as super high energy very small sizes like gamma ray photons, or larger x-rays, visible light, microwaves or the very large, but very low energy radio waves. 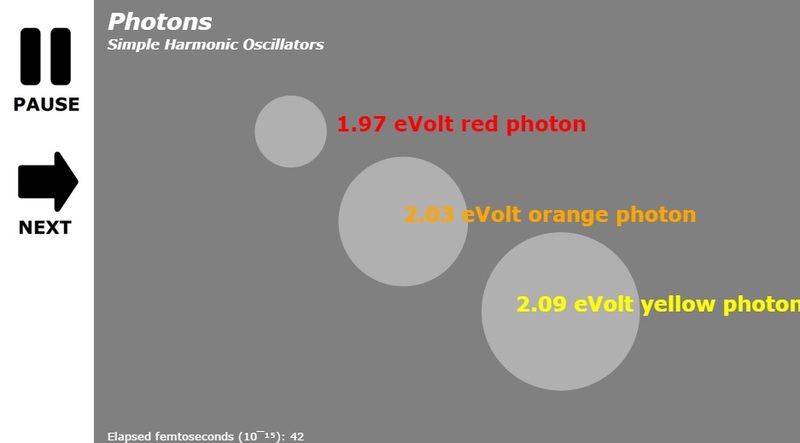 Photons store energy and cycle over specific timeframes like oscillators (called its phase). Photons have an electrical/magnetic orientation called its polarization. 3. Energy is repelled by itself (dark energy). 4. 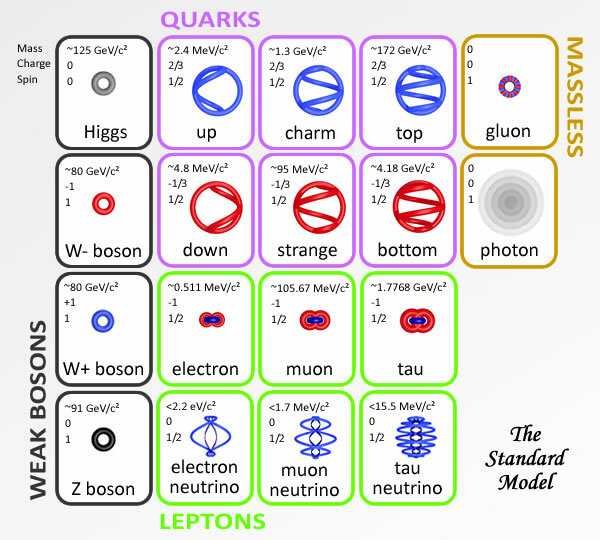 The Strong Interaction - Nuclear binding force, super strong at short distances where more energy required to separate quarks then is needed to create a new one. We are a group of people determined to model the world of physics through animations. Tell us what you can do. Join the team! Using animations to understand the world around you!